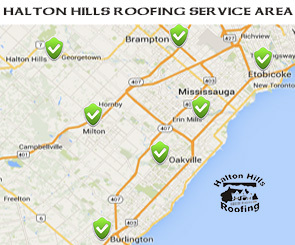 Thank you for choosing Halton Hills Roofing. Due to a high volume of demand we have created this useful page of information to help you go through our warranty process. Once you have read the terms below and filled out our form, provided us with information we can schedule someone to get back to you within the next 2-4 weeks. Halton Hills Roofing offers a Ten year warranty on labour. Labour warranty is void if the roof is altered or has been tampered with. Labour warranty does not cover damage due to weather or nature. No warranty against leakage for existing skylights. No warranty on damage caused by winter ice damming. Step 3 – Please also attach 2 pictures of the damage that has accrued. Step 5 – Someone will contact you. ** Please note there is a MIN 250$ service call fee for every visit. BP warrants its Vangard 42 IR, Manoir, Everest 42 and Mystique 42 shingles for 15 years after the installation of the shingles and its Yukon SB and Dakota shingles for 5 years after the installation of the shingles, against blow off or damage due to wind velocities, including gusts, up to the speeds specified in the Limited Warranty Coverage Table (Regular Installation) below. For the Warranty against wind blow-off to take effect, the self-seal adhesive must be subjected to sufficient heat to activate the bond. When the shingles are installed in environmental conditions that will not produce such temperature or in very windy areas, the shingles should be sealed down with spots of asphalt plastic cement as specified in CSA A123.51-M85. The foregoing Wind Damage Limited Warranty does not apply unless the shingles have been installed as required by this Warranty and self-sealing adhesive strips have properly bonded. If BP shingles which meet the above conditions blow off or are damaged by winds not exceeding the velocities set out in the Limited Warranty Coverage Table (Regular Installation) below, BP will, at its option, reimburse the owner of the building the reasonable cost of replacing the blown off or damaged shingles and/or hand sealing the remaining shingles, as required. Data available from Environment Canada and/or the National Weather Service will be used to determine wind and gust speeds. 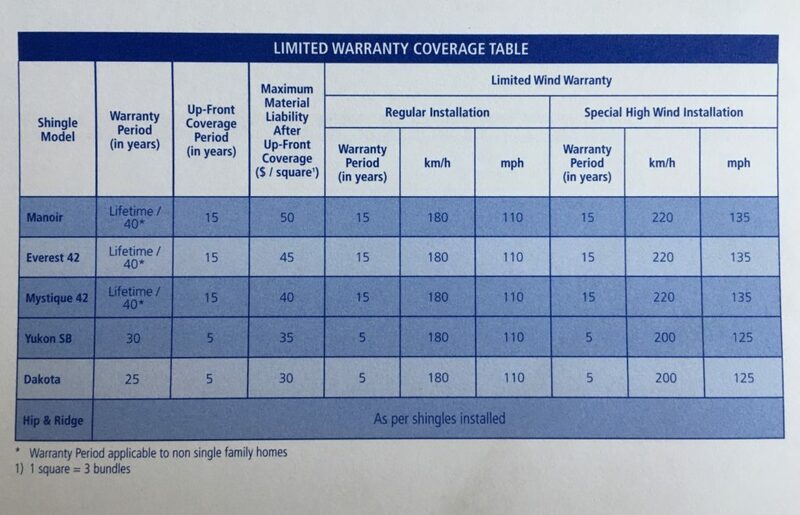 High wind Warranty coverage for wind velocities, including gusts, up to the speeds specified in the Special High Wind Installation section of the Limited Warranty Coverage Table below is only available when shingles are fastened with 6 nails and the shingles at the roof edges are secured with a thin 4 inch wide layer of asphalt plastic cement. If the shingles are not installed according to the Special High Wind Installation instructions, the terms and conditions of the Wind Damage Limited Warranty applies up to the speeds specified in the Limited Warranty Coverage Table under Regular Installation. After a Wind or Natural Disaster Storm ?